See ancient statues of important people in the history of Guatemala and the region. Minimum of 1 passengers (adults) is required for the tour to run. If the minimum size is not reached, the tour is subject to cancellation and all tickets are refunded or rescheduled. "La Nueva Guatemala de la Asunción" is the official name of the city, it's also the cultural, religious and business center of the country. The metropolis is about 5 million people, has a panoramic contrast between the colonial architecture combined with modern buildings, important museums and historical monuments offers the visitors a unique experience. Your tour begins with the pick-up at your hotel. First, we will visit Las Americas avenue, which is named after the reform drawn in the late nineteenth century, due to the formation of the Organization of American States on April 30th, 1948. The area comprising the Avenue of the Americas was demarcated in several farms in the early decade of the 50’s with the intention of dedicating land to the American continent. We will then continue to the Civic Center of the City, a set of buildings constructed between the 50’s and 60’s and includes: the Supreme Court of Justice, the Ministry of Public Finance, City Hall, the Social Security, the Bank of Guatemala, the National Mortgage Bank, and the Guatemalan Tourism Commission. The Bank of Guatemala is decorated with high relief murals by Dagoberto Vasquez describing the history of the country, and also includes a mosaic by Carlos Mérida. Next we continue to the Major Plaza of the Constitution. This Plaza is the heart of the Historic Center of the city. It is surrounded by important monuments such as the National Palace (now the Cultural National Palace and museum), the Metropolitan Cathedral, the Portal of Commerce and Centenarian Park. 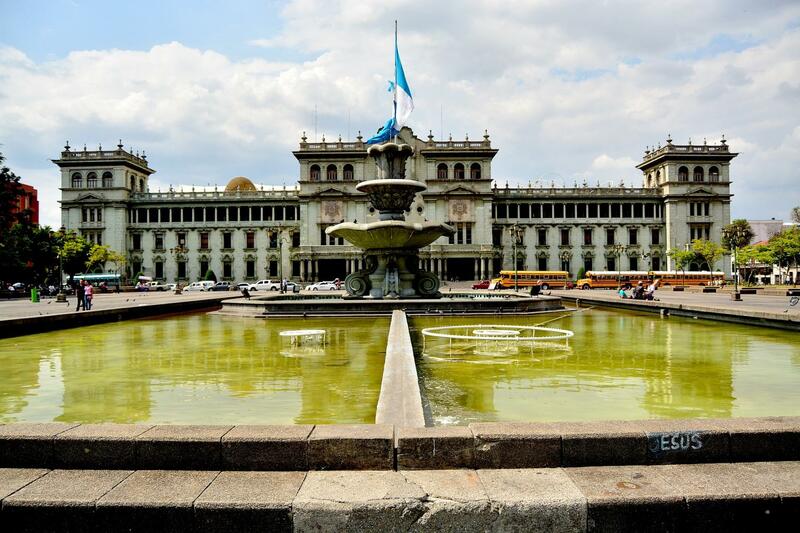 A few steps away are the National Library and the General Archive of Central America. The tour includes a visit to the Central Market, which is located behind the Metropolitan Cathedral, in the basement of the Tabernacle Plaza. There, visitors can buy a variety of art and handicrafts from all over the country; ceramics, textiles, leather, wood, and silver. The tour concludes transfer back to the hotel. Juan Pablo knew literally everything about the city and made our experience amazing! We learned so much and had so much fun with him and Mynor! We will definitely recommend those two for anyone who wants to see Guatemala City safely and get the most out of it! Debería ser más tiempo en paseo cayala o eliminarlo del tour, solo lo llevan a uno y le dicen que si se quiere bajar. No es realmente un tour en esa parte. Great tour guide. Great driver. Clean comfortable modern vehicle. Given good overview of entire city, its history and landmarks. If I go back I would definitely book either a full day tour, different more specific city tours to go in depth at some of the historic, government and other landmarks. In the end though it's the guide who makes the experience special and our guide did just that. Pretty good and easy to use. 100% recomendado!!! El chofer y el guía, Juan Pablo, nos recogieron puntualmente en el hotel. Nos trasladamos en una mini van, mientras Juan nos iba explicando los sitios relevantes de nuestro recorrido. Caminamos por el centro y conocimos los diferentes puntos históricos de la ciudad. Visitamos el mercado central y de regreso nos quedamos en Paseo Cayalá. En todo momento nos sentimos muy seguras en nuestro paseo.